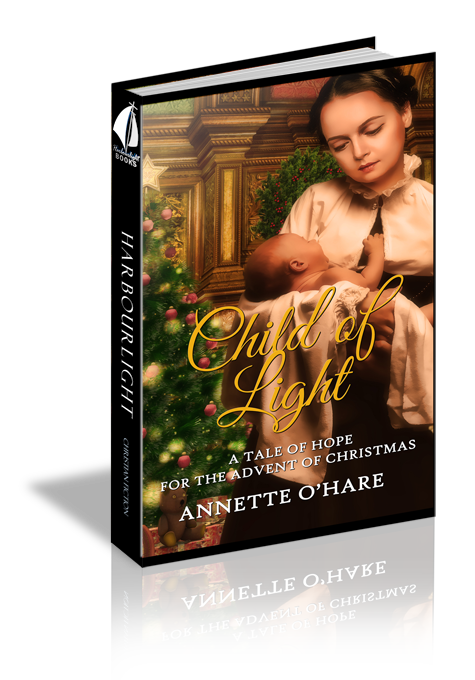 Will Margaret's prayers for a child of her own be answered this Christmas or does God have something else in store? Margaret stared out the third story window of Boston’s St. Agnes Refuge for Young Women. Plump, shimmering snowflakes floated gently from the heavens, and collected into fluffy white mounds on the ground below. She shuddered at the sight and gathered her warmest knitted shawl tighter around her neck. Nary a day above fifty in the three months since she and Thomas arrived; she longed for the warmth of South Texas. Had it been only four days since she’d singlehandedly prepared a Thanksgiving Day feast for the entire Murphy clan? And now…Christmas was upon her. The bright-eyed young woman jarred Margaret from her daydream of a more temperate climate. She proudly displayed her sewing for her teacher’s inspection. The girl handed Margaret what was to be a proper skirt for her job interview at Lowell Mills, north of Boston. She examined the sloppy stitching on the garment and sighed. Margaret smirked at the girl’s ridiculous remark. Of course I can do a better job. I’m the teacher. Oh, what’s the use? She huffed out a frustrated breath. Opening a drawer on the sewing desk, she retrieved a seam ripper and went to work on Eugenia’s skirt. The process of splitting apart the muddled stitch-work was akin to how she felt leaving her home and family in Bolivar, Texas. But when news arrived of her father-in-law’s injury, they had no other choice but to come to his aid. Thomas’s father had fallen off a ladder and broken both an arm and his leg. Poor old Pappy Murphy was unable to walk, much less work at the seafood processing business he had partnered in. Powerless to do anything for himself, he moped about like a piteous child, never asking her for a thing and not wanting to be a bother. Margaret loved the dear, sweet man and tried her best to act happy in his presence despite how much she disliked having to move from her home. Margaret sighed and returned the small embroidery scissors to the drawer. Even though she dearly loved her father-in-law, her heart ached for the family she’d left back home in Bolivar. She’d never lived apart from them and had no idea how long she and Thomas would be staying in Boston. Oh, how she missed Mama, Papa, and her little siblings. Each day when she finished teaching at St. Agnes, Margaret ate a quick bite before heading off to her second job. She opened her purse and reached for the fish and buttered bread she’d wrapped in paper that morning. Beneath the parcel of food, an envelope addressed to her in a familiar hand brought a smile to her face and warmth to her heart. She had forgotten bringing the missive to read on her break. The letter called to her, but so did her stomach. An appetizing aroma of chicken and dumplings wafting up from the kitchen below had taunted her all morning. Unrolling the paper around her meal, she took a bite of the fish before opening her mail. Mama’s voice spoke to her as she read. You won’t believe who showed up at our door this past Sunday. Elizabeth and her new husband, Calvin Littleton! Margaret gasped, and in doing so, choked on the food in her mouth. She coughed up bits of fish and cleared her throat. The news of her younger sister’s marriage came as a shock. Elizabeth married Calvin Littleton? Goodness, Mama! Aren’t you even one bit concerned about that? Admittedly her sister had known the boy a very long time. But they met at the State Lunatic Asylum in Austin, Texas—as patients. Margaret took another bite of fish and continued reading. The best part of all is that Elizabeth and Calvin are expecting their first child. I’ll be a grandma, and very soon too! Margaret held the letter in one hand and fish in the other. She almost gasped again but thought better of it. Oh, Elizabeth…I pray you weren’t forced to marry because you were in the family way. Of course, that would explain a lot. Mama went on to say: I hope you won’t mind, but we’ve allowed the newlyweds to move into your house next door until you return. Your papa and I have gotten used to having just the two little ones at home, and we knew you wouldn’t mind them staying at your place for a while. Margaret wanted to throw the letter in the wastebasket, but she couldn’t. Her hunger for news of any kind from back home overruled her desire to discard Mama’s letter. She continued reading about the latest gossip around the peninsula and the most recent antics performed by her little siblings, June and Jeremiah. Messages from Mama were usually the highlight of the day, but this one rubbed her the wrong way. She dropped the offensive piece of mail into her bag and pouted. Mama had to know how hurtful hearing the news about Elizabeth’s pregnancy would be for her. How many times had Margaret cried with her mother concerning that very subject? Not only was Elizabeth going to have the first grandchild, it would be born in Margaret’s very own house. She crossed her arms over her middle, hating everything about herself, from her unfruitful womb to her shameless jealousy. Tears rimmed her bottom lids. Lord, how can You be so cruel to Thomas and me? What have we done to make You want to punish us? Five years we’ve been husband and wife. Five years we’ve put You first in our marriage and our lives. And for five years we have remained childless. Father, I beg Your forgiveness for my covetousness and please…have mercy on Your children. Once again Margaret pleaded her petition to God. Would He hear her, or would her prayer go as far as the ceiling and fall to the ground like every time before? Either way, there was no time to worry about it. There was a dress and romper she needed to finish sewing that evening in order to get it in the mail in time for her little brother and sister’s Christmas. And now there was a little niece or nephew on the way she needed to consider. Wiping away the single tear that slid down her cheek, Margaret turned her attention to cleaning the work area. She picked up sewing supplies and scraps of cloth and thread her students had left behind. There would be a talk about the girls picking up after themselves in the very near future. But that was a job for another day, because there was somewhere she needed to be. A few blocks away a much more demanding job awaited her arrival.